When you are migrating from one phone to another it is hard to move your contacts.In phone contacts will be saved as .vcf files.Sometimes there will be multiple .vcf files.In that case we need to merge these files .There are many software to do the job.But I will show you a simple technique to do this with the command prompt. Step 1:Put all the .vcf files in one folder. 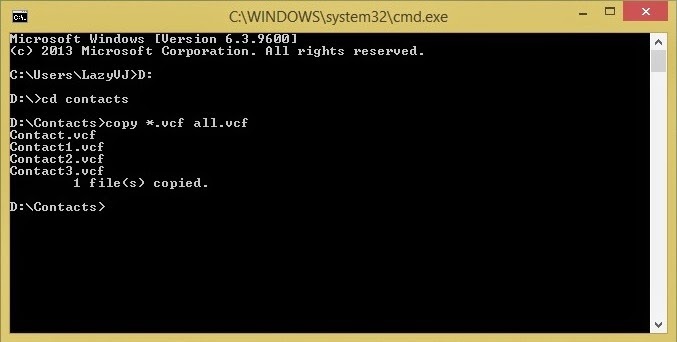 Step 2:Open Command Prompt by pressing Ctrl+R buttons. Assume that your contacts are in a folder 'Contacts' and in Local Disk D.
In command prompt type D: and press Enter. Type cd contacts (here contacts is the folder inside the drive D.You can change the location as you like) and press Enter. Type copy *.vcf and press Enter. Now all your .vcf files are combined into one file. If you have any doubts feel free to contact us or leave a comment below.We are happy to help you.